(HealthDay News) — Both thyroidectomy and statin use are associated with lower risk for developing thyroid-associated ophthalmopathy in individuals with Graves’ disease, according to research published in JAMA Ophthalmology. Joshua D. Stein, MD, of the University of Michigan in Ann Arbor, and colleagues conducted a longitudinal cohort study of 8,404 patients, aged 18 years or older, with newly diagnosed Graves’ disease. The authors examined risk factors associated with the development of thyroid-associated ophthalmopathy among patients with newly diagnosed Graves’ disease. 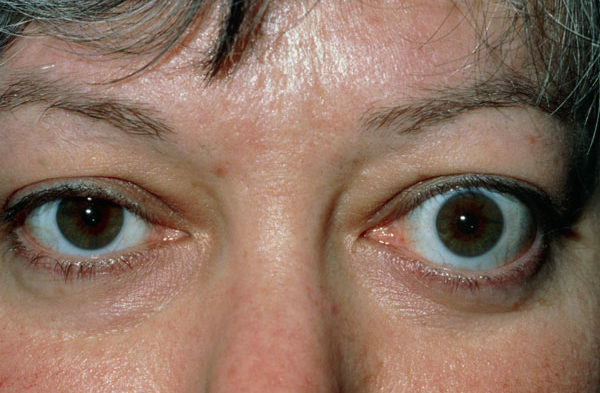 The researchers found that 8.8% of patients with newly diagnosed Graves’ disease developed thyroid-associated ophthalmopathy. After adjustment for potential confounders, surgical thyroidectomy, alone or combined with medical therapy, was found to be associated with reduced risk for thyroid-associated ophthalmopathy (adjusted HR=0.26; 95% CI, 0.12-0.51) compared with radioactive iodine therapy alone. Use of statins for 60 days or more in the previous year, compared with less than 60 days of use or nonuse, was associated with reduced risk for thyroid-associated ophthalmopathy (adjusted HR=0.60; 95% CI, 0.37-0.93). Use of nonstatin cholesterol-lowering medications or cyclooxygenase 2 inhibitors did not appear to affect development of thyroid-associated ophthalmopathy. “A prospective study is needed to substantiate these findings and to assess whether statin use or a thyroidectomy may delay or prevent [thyroid-associated ophthalmopathy] in patients with [Graves’ disease],” the researchers wrote. Stein JD et al. JAMA Ophthalmol. 2014;doi:10.1001/jamaophthalmol.2014.5103. Benign Thyroid Nodules: When Should Repeat Evaluation Be Performed?